one of the main downsides of diesel fuel is that it does not fare well in cold weather. When temperatures drop, diesel forms crystals that clog fuel filters and fuel lines. Not only does this cause engines not to start, but it can also lead to costly repairs if engines get damaged. 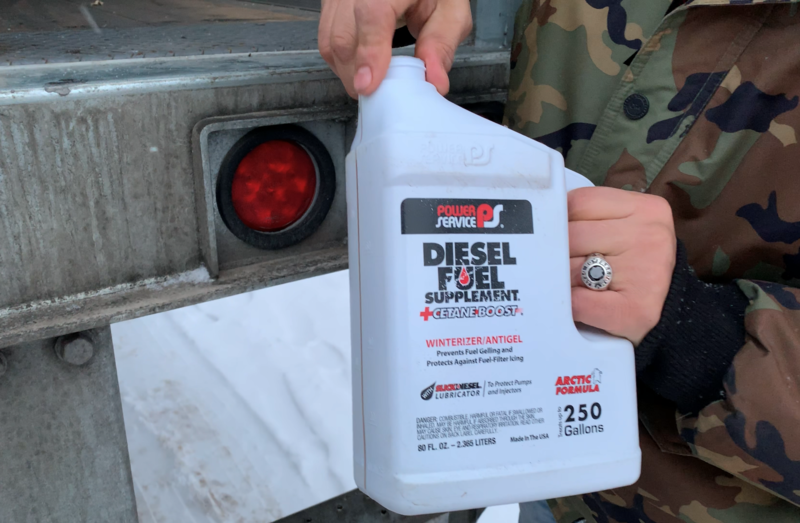 In extreme cold, even the best winter blend diesel fuel can reach its cloud point (the measure of diesel’s low-temperature operability) and begin to gel up. Due to so many differences in fuel quality existing across North America and the fact that each vehicle’s exposure to cold weather will be different, there is no definitive temperature in which diesel begins to gel. However, most fuels reach their cloud point between 20 degrees F and -18 degrees F. To prevent diesel fuel from gelling (or crystallizing) you should use an anti-gel fuel supplement. Make sure to use an all-season additive or one that’s specifically designed to work well in cold climates. Anti-gel additives are easy to use! All you do is top off your fuel tank with the treatment. Anti-gel additives drop the freezing point of diesel fuel so that it is less likely to freeze in cold temperatures. Anti-gel additives are also designed to lower the Cold Filter Plugging Point (CFPP). The CFPP is the lowest temperature at which fuel will still flow through a specific filter. Why add anti-gel to diesel fuel? The reason why we have to add an anti-gel additive to diesel is that diesel fuels contain wax. Normally the wax is a liquid in solution in the fuel. The problem with the wax is that this is what causes fuel to gel, and gelled fuel (or crystals) can block engine fuel filters. If the temperature is low enough then this will cause the engine to gel up completely and keep it from working at all. So why don’t we just remove the wax and skip the gelling issue altogether? Well, the reason we have the wax component is that it gives fuel a good cetane value. Cetane offers power and better engine responsiveness. Wax content is lower in the winter but remains in diesel blends for cetane. So when should you start adding anti-gel additives to your diesel? The rule of thumb is that the lower the temperature, the more fuel additive needs to be added. We suggest that you follow the instructions on the bottle of your anti-gel. If the weatherman is anticipating a cold front, you are better off adding an anti-gel additive in preparation. Preparation is key. Anti-gel additives won’t damage your engine so when in doubt use extra. Use an anti-gel additive whenever you fill up at the pump in the winter. Most additives can be added before or after you add fuel. We like to add beforehand to ensure good mixing. Add an anti-gel additive as soon as possible. If your fuel is already gelled or your fuel lines are clogged up we recommend using an emergency additive that dethaws fuel and de-ices filters. These emergency treatments re-liquify fuel so that it can be combustible again. Keeping up with this simple trick can keep your truck safe and help you avoid costly maintenance fixtures. zfumjylxyvo,Hi there, just wanted to say, I liked this article. It was helpful. Keep on posting! jienalezwp,Thanks a lot for providing us with this recipe of Cranberry Brisket. I’ve been wanting to make this for a long time but I couldn’t find the right recipe. Thanks to your help here, I can now make this dish easily. cerpnmommf,This website truly has alll of the information and facts I wanted about this subject and didn?t know who to ask. qihxyr Yeezy 350,If you are going for best contents like I do, just go to see this web page daily because it offers quality contents, thanks! qoshifybdv Adidas Yeezy,This website truly has alll of the information and facts I wanted about this subject and didn?t know who to ask. qcssja,Thanks for sharing this recipe with us!! hey there and thank you in your information – I’ve definitely picked up something new from proper here. I did however experience some technical issues the use of this website, as I skilled to reload the site many occasions prior to I could get it to load properly. I had been considering if your hosting is OK? Now not that I am complaining, but slow loading cases times will sometimes impact your placement in google and could harm your high quality ranking if advertising and ***********|advertising|advertising|advertising and *********** with Adwords. Anyway I am including this RSS to my email and can look out for much extra of your respective fascinating content. Ensure that you replace this again very soon..
qevhxcdp,Very informative useful, infect very precise and to the point. I’m a student a Business Education and surfing things on Google and found your website and found it very informative. My spouse and I absolutely love your blog and find a lot of your post’s to be just what I’m looking for. Would you offer guest writers to write content for you? I wouldn’t mind creating a post or elaborating on a few of the subjects you write regarding here. Again, awesome site! What’s Going down i’m new to this, I stumbled upon this I’ve discovered It positively helpful and it has helped me out loads. I hope to give a contribution & aid different users like its helped me. Good job. Goedkoop betrouwbaar rotterdam, http://onlineapothekerzonderrecept.life/voltaren.html , kopen online aanbieding. I don’t even understand how I stopped up right here, however I assumed this put up was once great. I do not understand who you’re however definitely you’re going to a famous blogger if you happen to aren’t already 😉 Cheers! I’ve learn some good stuff here. Certainly price bookmarking for revisiting. I surprise how much attempt you place to create such a excellent informative web site. I’m writing because I want to suggest on the already great work on the alcohol content on logiflexinc.com. Things are getting a bit outdated… and Google just updated their algorithm yet again, you know how that’ll impact your most important traffic source, if there isn’t a consistent flow of fresh articles! You see, most businesses get majority of their organic traffic from their blogs, and I feel that you could use a little help, since you are not blogging weekly for now. You are receiving this message because the contact form at logiflexinc.com is open to the public. Thank you. There’s a lot of upsides to diesel fuel. More vehicular power, greater fuel economy, but one of the main downsides of diesel fuel is that it does not fare well in cold weather. When temperatures drop, diesel forms crystals that clog fuel filters and fuel lines. Not only does this cause engines not to start, but it can also lead to costly repairs if engines get damaged. In extreme cold, even the best winter blend diesel fuel can reach its cloud point (the measure of diesel’s low-temperature operability) and begin to gel up. Due to so many differences in fuel quality existing across North America and the fact that each vehicle’s exposure to cold weather will be different, there is no definitive temperature in which diesel begins to gel.